So XCOM 2 has been out for a while, and I recently got my grubby mitts on it when it went on sale on Steam recently. Here’s what I think. Naturally, I washed said grubby mitts before digging in. Don’t want to funk up my beautiful PC. XCOM 2 is a sequel to Enemy Unknown. The aliens have won and taken over. You, the commander, were captured, and subsequently rescued, so the games begin. As a getting attached to your squad simulator, you can find none better than XCOM. The stakes are high. Losing one of your better soldiers means you might lose an entire squad of rookies in your next encounter. That hasn’t changed, and is one of the things I like most about XCOM. In terms of gameplay, the game has not changed a whole lot. This, to me, is a strength, and allowed me to skip a (probably) annoying tutorial and turn off any other assists the first time around without too many problems. As for changes, there are a few. The entire scenario feels entirely different. No longer are you defending your world against the threat of an alien invasion, now you are trying to capitulate an alien reign of terror from the inside out. The game does well to maintain a familiarity, while throwing just enough curveballs your way that it keeps things fresh. Some of the biggest changes come in the form of the enemies themselves. Remember the Sectoids? ( Minor Spoiler Alert) Instead of the diminutively squishy beings you encountered before, they have now integrated human DNA so that they are physically more robust with even more terrifying psionic abilities. Mutons? They make a return too, albeit in a more streamlined and agile form. Thin Men? Since the aliens won and they no longer have to disguise themselves, you are treated with their true form. They are now more dangerous than ever. There is also a variety of new and challenging enemies for you to take down, or alternatively, to decimate your entire squad because you weren’t quite prepared for them. One of my favourite things about this game, as with Enemy Unknown, is researching these new and terrifying beings. The cutscenes are well-voiced, the main characters are engaging and sympathetic. On one hand, you have Tygan, your lead researcher who had up until recently been plying his trade for the aliens who he and majority of the world thought were benevolent in their intentions. On the other, you have Shen, your lead engineer, who hadn’t ever lived in a city center. Between them, they flesh out the world talking about their livelihoods and experiences, and their relationship with each other. The way they address you, the Commander, is quite well done as well. You don’t get to say anything, but rather than simply watching them interact, the game makes you feel like you’re standing there with them. Another big change, but unsurprising, is that “The Council” is a thing of the past. 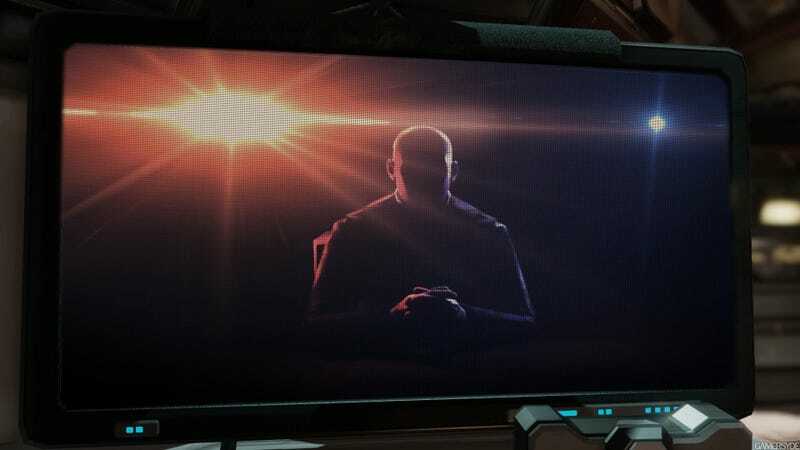 However, the stoic, shady bald guy who addressed you on screen in the last game is back as the only member still active and supporting XCOM. For me this is a big win, I think he has a rather cool voice. This is one of the things that made Enemy Unknown great, and having him return is very welcome, indeed. The same, but different- the Avenger had been in a state of disrepair filled with the leftovers of Enemy Unknown which you now have to clear out in order to construct new, more relevant facilities to counter a completely different threat. Another interesting mechanic are “Dark Events” that occur periodically through the course of your campaign. Conducting various missions can help counteract these events which have various effects, such as increasing the radius in which enemies can spot your soldiers, increasing the cost of recruitment or dispatching a UFO to hunt the Avenger. There are usually 3 dark events being prepared at a time, with one of them hidden, and you have to choose which one you want to counter. These can occur at very inopportune times, which add to the tension and sense of urgency. Perhaps your squad is a bit thin, then BAM that hidden event you ignored makes recruitment more expensive. Now you can’t upgrade your weaponry because you needed a couple more dudes for your squad, in this case perhaps you were countering an event that accelerated the construction of a new facility which would have been inconvenient but not so much as increased recruitment costs. One thing I miss, however, is kitting out interceptors and taking out UFOs. I can’t really fault the game on this, unless I’m nitpicking. This only really occurred to me several hours in, so I would say it’s more of an afterthought on my part. Graphically, XCOM 2 is rather impressive. I managed to run it on it’s highest settings, and was rather impressed with the results on my decidedly mid-range gaming PC. The aliens are impressively detailed, in all their weird and wonderful glory. I’m not much of a graphics fundi, I must admit, so YMMV. In terms of environments, I would say it’s more of the same - and that’s not really a bad thing. They probably have changed things considerably, but I didn’t really notice much. Perhaps some buildings are taller, perhaps the maps are bigger, perhaps more detailed, I don’t know. I mostly focused on how I could use the environment to position my dudes most effectively. Last, but not least, I must state categorically that XCOM 2 is an aural delight. The futuristic, sci-fi SFX are all pretty great, be it firing a plasma lance or the snarl of an alium on the receiving end of the shot. I have already mentioned the stellar voice acting, all of this combines to make this game as immersive as it can possibly be. All in all, I would say XCOM 2 is a fitting sequel to the brilliant Enemy Unknown, perhaps equally as brilliant in it’s execution. I would highly recommend the game to anyone who likes the XCOM formula of turn-based strategy, most recently emulated by the awesome Mario + Rabbids: Kingdom Battle. To be dead honest, Mario + Rabbids gave me the itch for the more serious, high stakes XCOM so I jumped at the opportunity when there was a special. However, I would definitely recommend playing Enemy Unknown first for context purposes. No reason not to, just play Enemy Unknown first! If you’ve played XCOM 2, let me know what you think! If you haven’t, tell me why not. Do you think we should get an XCOM 3? I certainly do. I can’t get enough of XCOM!